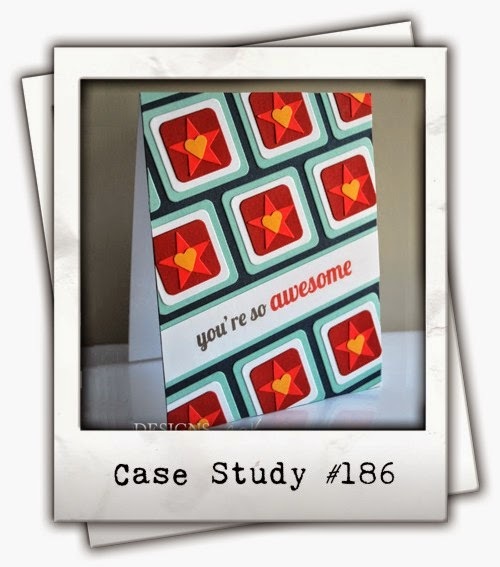 A quick post to share a card I made for CASE Study Challenge #176. Take a look at the wonderful inspiration provided by the current Muse, Jaclyn Miller. I was inspired by the layout of Jaclyn's card. This angled layout isn't something that I would usually do, so I knew it would be a challenge for me. That's the idea right??? I struggled for a while, but eventually came up with this. I used a set of tag dies that I won from Paper Crafts Magazine a while back. I was one of the random winners of a sweepstakes. It was a lot of fun to open that box of paper crafting goodies from PC! This is so fun! All those different patterned tags in different colors and shapes is just so whimsical and eye catching! What a great way to use those little tags. It's so unique and cute!